Download "ONTARIO SUPERIOR COURT OF JUSTICE"
3 3 Administrator will use this data in the calculation of an Authorized Claimant s Nominal Entitlement according to the formulas listed below. 5. The date of a purchase, sale or deemed disposition shall be the trade date, as opposed to the settlement date, of the transaction. 6. A Claimant s Nominal Entitlement will be calculated as follows; I. No Nominal Entitlement shall be attributed to any Eligible Shares disposed of prior to the alleged corrective disclosure, that is, prior to or on January 16, II. 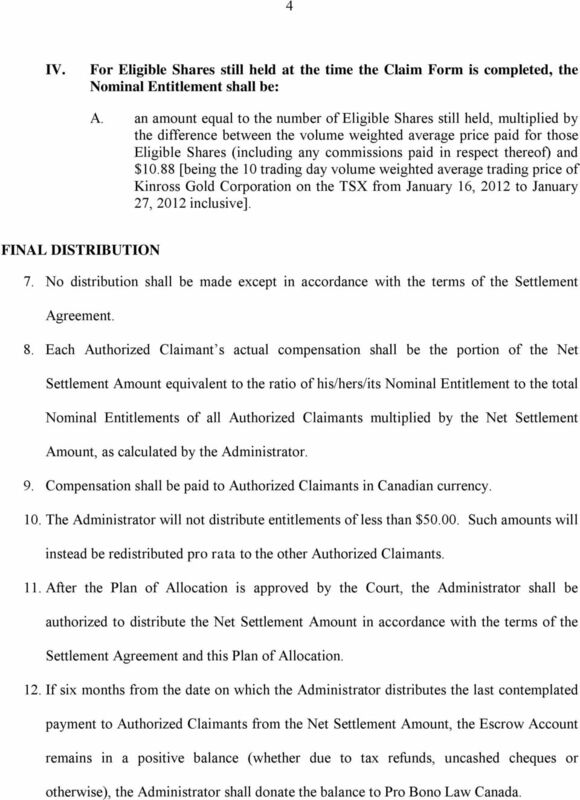 For Eligible Shares disposed of between the alleged corrective disclosure and the end of the 10 trading day period following the alleged corrective disclosure on January 16, 2012, that is, on or between January 17, 2012 and January 30, 2012, the Nominal Entitlement shall be: A. an amount equal to the number of Eligible Shares thus disposed of, paid for those Eligible Shares (including any commissions paid in respect thereof) and the average price per share received upon the disposition of those Eligible Shares (without deducting any commissions paid in respect of the disposition). II. 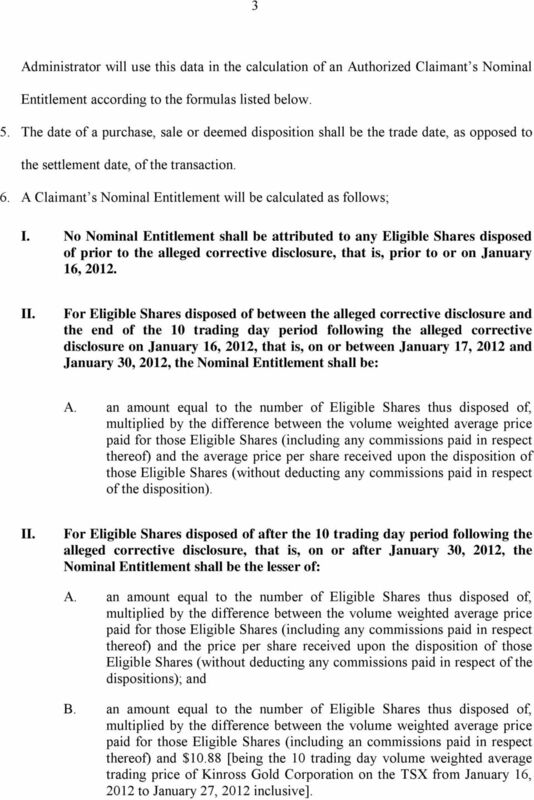 For Eligible Shares disposed of after the 10 trading day period following the alleged corrective disclosure, that is, on or after January 30, 2012, the Nominal Entitlement shall be the lesser of: A. an amount equal to the number of Eligible Shares thus disposed of, paid for those Eligible Shares (including any commissions paid in respect thereof) and the price per share received upon the disposition of those Eligible Shares (without deducting any commissions paid in respect of the dispositions); and B. an amount equal to the number of Eligible Shares thus disposed of, paid for those Eligible Shares (including an commissions paid in respect thereof) and $10.88 [being the 10 trading day volume weighted average trading price of Kinross Gold Corporation on the TSX from January 16, 2012 to January 27, 2012 inclusive]. 4 4 IV. For Eligible Shares still held at the time the Claim Form is completed, the Nominal Entitlement shall be: A. an amount equal to the number of Eligible Shares still held, multiplied by the difference between the volume weighted average price paid for those Eligible Shares (including any commissions paid in respect thereof) and $10.88 [being the 10 trading day volume weighted average trading price of Kinross Gold Corporation on the TSX from January 16, 2012 to January 27, 2012 inclusive]. FINAL DISTRIBUTION 7. No distribution shall be made except in accordance with the terms of the Settlement Agreement. 8. 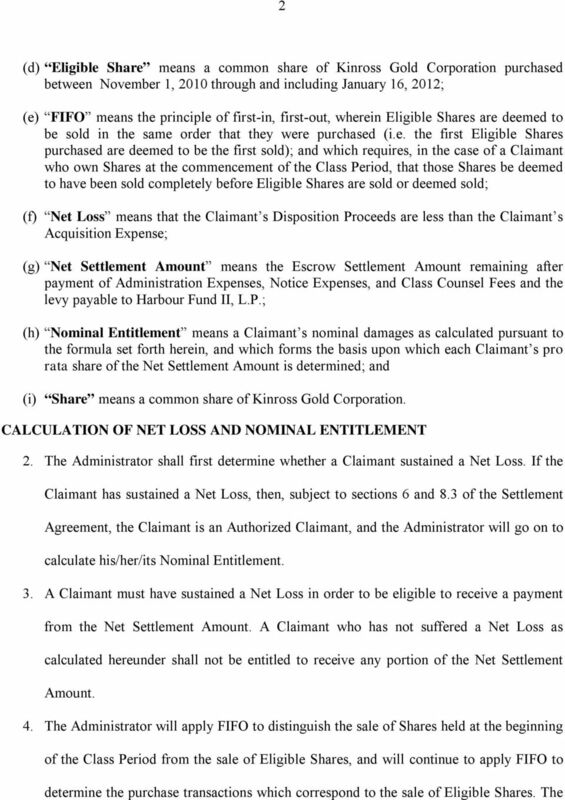 Each Authorized Claimant s actual compensation shall be the portion of the Net Settlement Amount equivalent to the ratio of his/hers/its Nominal Entitlement to the total Nominal Entitlements of all Authorized Claimants multiplied by the Net Settlement Amount, as calculated by the Administrator. 9. Compensation shall be paid to Authorized Claimants in Canadian currency. 10. The Administrator will not distribute entitlements of less than $ Such amounts will instead be redistributed pro rata to the other Authorized Claimants. 11. After the Plan of Allocation is approved by the Court, the Administrator shall be authorized to distribute the Net Settlement Amount in accordance with the terms of the Settlement Agreement and this Plan of Allocation. 12. 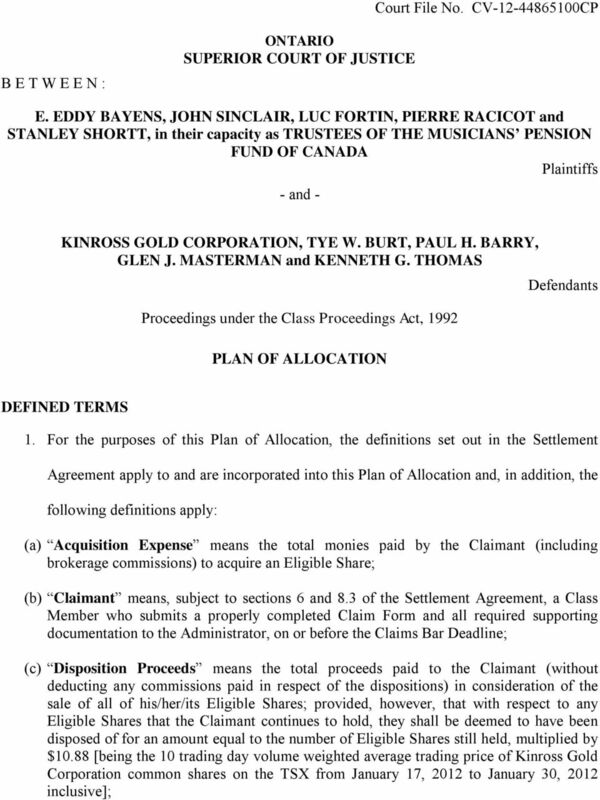 If six months from the date on which the Administrator distributes the last contemplated payment to Authorized Claimants from the Net Settlement Amount, the Escrow Account remains in a positive balance (whether due to tax refunds, uncashed cheques or otherwise), the Administrator shall donate the balance to Pro Bono Law Canada. Cy pres funds directed to BayLegal advance justice for the poor. Certain capitalized terms in this Premium Dividend and Dividend Reinvestment Plan have the meaning assigned to them under "Definitions" below. BMO ETFs. Distribution Reinvestment Plan. All defined terms used herein are defined under the heading Important Terms below.